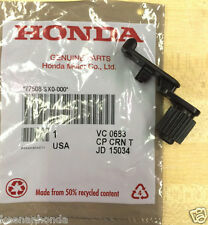 96-00 Honda Civic Glove Box Latch. Color Is Dark Grey. You may also be interested in. 06-11 Honda civic sedan tan glove box. Great shape. 01-05 Honda Civic OEM glove box. Normal wear like scuffs and light scratches. Perfect and stylish Car Storage Box for you must have in your car. Take off the double sided tape from the storage back. Back by the soft plastic, double-sided tape, you can be easily attached to your car dashboard. Parts only. Technical Support. Digital photos are required for all cases of defective item. Digital photos will be required for all cases. Item will be wrapped in an bubble envelope. Car SUV Boot Trunk Foldable Cargo Storage Box Bag Case Organiser Multi-function. Reclaim your trunk space with this handy folding car organizer. Great for your Trunk or back seat. Color: Black. 1996-2000 Civic - sedan. We do not provide product liability coverage and a professional technican should always be used to evaluate and safely instal any vehicle parts. Windshield Wipers & Parts. Windshield Washer Tanks. 2006-2011 Civic - coupe. We do not provide product liability coverage and a professional technican should always be used to evaluate and safely instal any vehicle parts. Windshield Wipers & Parts. Windshield Washer Tanks. Vehicle Trim : DX. Vehicle Model : CIVIC. Vehicle Body : Coupe. Vehicle Make : HONDA. Part OEM : Factory, Genuine, OEM. - The item has "small scratches" or "normal wear" due to the fact that these are used OEM parts.